1x Bügelbrett Wandhalterung (ohne Bügeleisen und Bugelbrett). Material: Stahl verchromt. So bewahren Sie Ihr Bügelbrett platzsparend auf! Geeignet für alle gängigen Bügelbretter und Bügeleisen. Umgehende Bearbeitung Ihrer Anliegen sorgt für Ihren sorgenlosen Einkauf. Häfele Bügeleisen- und Bretthalter zum Schrauben. Gasdruckfedern (5). Material: Stahl massiv. Handtuchhalter (18). Beleuchtung (8). Simonswerk Türbander (10). Sonstige (15). Helm Schiebetorbesc?hläge (38). Das Bügeleisen und das Bügelbrett dienen zur effektiven Aufbewahrung eines Platzes und mit einem Aufbewahrungskanal für einen einfachen Zugang zu den Mietern. Das Bügeleisen und Bügelbrett, um einen Ort effektiv zu speichern. Bügelbrett, Bügeleisen & Co. platzsparend verstauen – mit der mDesign Bügelbrett Aufbewahrung! In einer kleinen Wohnung ist oft kein Platz für Bügelbrett und Bügeleisen?. Die platzsparende Bügelbrett- und Bügeleisenhalterung von mDesign löst dieses Problem. MDesign Bügelbrett Wandhalterung – Bügelbretthalterung plus Korb für Bügeleisen und Zubehör – platzsparend Bügelbrett aufhängen – verchromt. Bügelbrett, Bügeleisen & Co. platzsparend verstauen – mit der mDesign Bügelbrett Aufbewahrung! 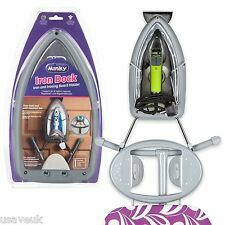 MINKY IRONING DOCK IRON & IRONING BOARD HOLDER. iron and ironing board in picture not supplied just the iron dock. OVER DOOR AND OR WALL MOUNTED USE. UNIQUE HUGGING ARMS TO SECURE IRON. Product Material: Iron. You can follow below process to chontact us. GBP 0.0 3307 sold. Color：As the picture shows. USD 0.0 3530 sold. NEW MINKY IRON HOLDER. 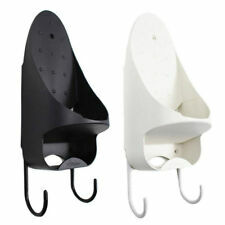 Easy release flex holder for safe and convenient storage. Safe storage for hot or cold irons. Minky Iron Holder. 34 x 18 x 11.2cm Holds all standard irons|Wall mounted complete with fittings|Heat reflective plate . Product Material: Iron. You can follow below process to chontact us. Color：As the picture shows. 1x folding ironing board. 1x ironing board cover. • White (RAL 9016) plastic coated steel ironing board. 1x folding support. 1x wall mounting bracket. ABOUT BULLER. T&C apply. VARIERA Plate holder, light beech, stainless steel. The plate holder is adjustable, so you can customizethe width based on the size of your plates. If we discover an error in the price of goods you have ordered we will inform you as soon as possible and give you the option of reconfirming your order at the correct price or cancelling it. White (RAL 9016) plastic coated steel ironing board. Cabinet Handles Everything Kitchen Bedroom & Bathroom Electricals & Lighting Ironmongery & Security Cabinet Components. Can be locked in left, right or inclined position. Our heat resistant iron holder is not only suitable for safely standing your hot iron on after ironing, you can even hang your ironing table on the adjustable hook when your finished! Ideal for safely standing the hot iron on after ironing. 1x folding ironing board. 1x ironing board cover. • White (RAL 9016) plastic coated steel ironing board. Covering Hood included. 1x Plastic Covering Hood. • White (RAL 9016) polystyrene covering hood. Hooks to secure ironing board. 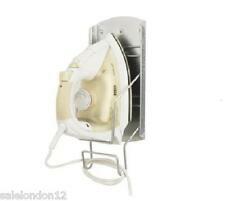 - Hot irons can be placed directly into the iron holder. - Over door and wall mounted use. - Unique 'hugging arms' to secure iron. - Over door brackets and wall fixings included. Ironing board fits nicely over most interior doors so you can iron where ever it is convenient from your bedroom closet, mud room, laundry room etc. This ironing board folds flat against the door when not in use so the board disappears behind closed door. Durable and sturdy ironing board storage system from mDesign. It uses a wall mounted rack to place the board on a wall or door; so you do not need to worry about the bulkiness of storing an ironing board in a case. Durable and sturdy ironing board storage system from mDesign. It uses a wall mounted rack to place the board on a wall or door so you do not need to worry about the bulkiness of storing an ironing board in a case. Truly designed for living. Good to organise your ironing products. Ideal for safely standing the hot iron on after ironing. Suitable for safely standing the hot iron on after ironing. Fitted with adjustable hook for hanging up your ironing table. The clever, space saving design allows the board to be folded up neatly out of the way when not in use. Then simply fold down and get ironing. The board can be swivelled through 180 degrees so it can also be used parallel to the wall on the left or right side if space is tight.